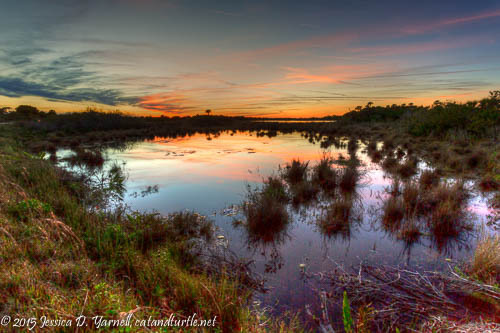 After my morning visit with bad light at Merritt Island National Wildlife Refuge last weekend, I decided to use my Monday off to return in the afternoon. My dad came with me to see his lifer Long-tailed Duck. What I didn’t expect was to see my lifer Clapper Rail that afternoon as well. It was a great afternoon! 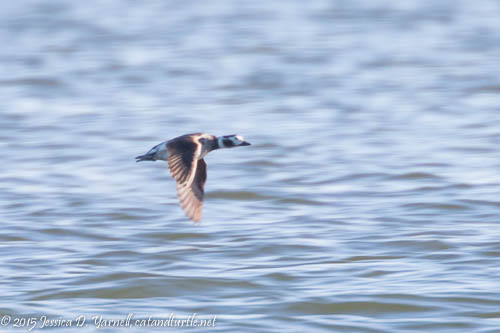 Long-tailed Duck in Flight. The namesake long tail is only visible during breeding season. Northern Pintails – the male on the left with the characteristic “pin tail”, and the female on the right doing what dabbling ducks do best – stick their butts in the air! A bunch of birders with scopes were set up near Pintail Heaven, so we walked down there to see what they were looking at. 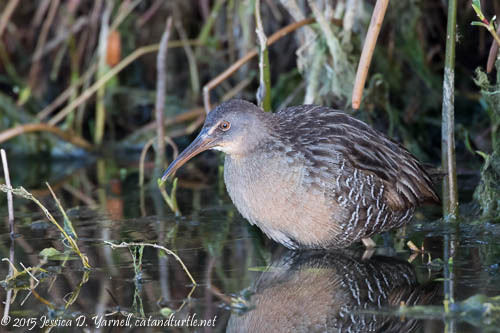 It turned out that a Sora and a Clapper Rail were both feeding along the edge of the vegetation. Finally – the exception that proves the rule – my lifer shot of a Clapper Rail wasn’t terrible!! Clapper Rail. 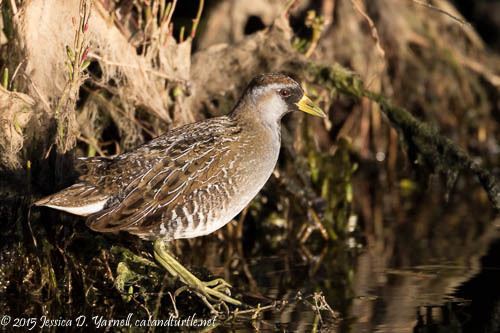 He hangs out in the salt marshes, where his cousin the King Rail prefers fresh water. The poor little Sora was jealous. Everybody was taking photos of the Clapper while the Sora foraged wide out in the open. By this time the afternoon light was just gorgeous on these shy birds. Sora. It’s not often to see one fully out in the open like this. 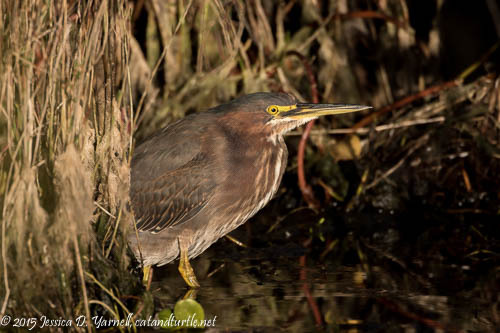 A Green Heron lurked in the shadows. He said that he deserved to have his photo taken, too, even if he wasn’t a rail. A bunch of coots were splashing about. 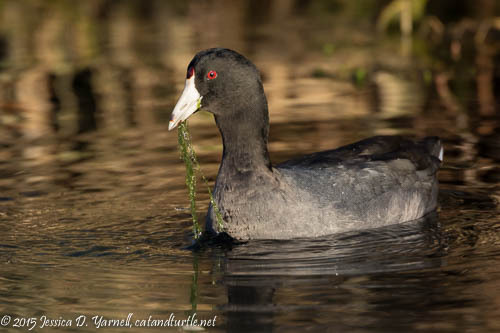 I just can’t resist a good coot shot sometimes, especially when he’s in beautiful light. Just when we thought the afternoon couldn’t get any better, it did. The Clapper Rail left the safety of the vegetation line and started swimming out in open water, right towards us! “Too much lens” was heard as I scrambled to get on a good angle. What a fun bird! 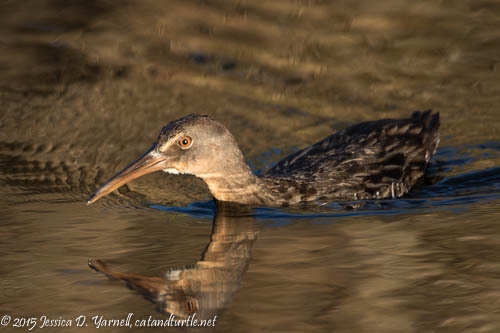 My Lifer Clapper Rail – Swimming! The clouds were really pretty in the sky, so we stayed an extra few minutes and photographed the sunset. 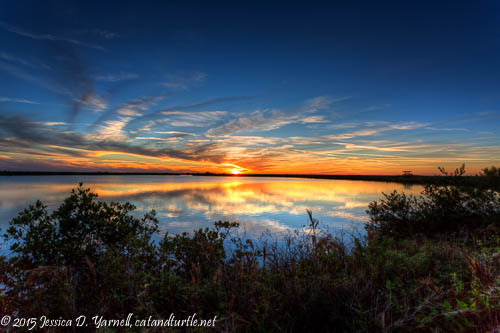 The sun glowed orange on the horizon as the breeze blew around us, the end to a great afternoon. What a great afternoon you had! Great decision to go back on Monday. Congrats on the lifer clapper! Wow – you had a wonderful trip! Great photos! Looks like you had quite the productive day! Would you please tell me better where the Rail and Sora were? I am sorry to bother you but hoping you’ll help me. Thanks. Thanks everybody! Yes, Deb, you need to get out shooting again. :) Ed, after following your blog for years, it’s nice to see that you’ve found mine too! Nancy, it’s never a bother to share good birding information. The Sora and rail were along Black Point at the ponds where the Northern Pintails usually hang out. It’s the most duck-y point on the drive. I don’t know the stop number. They were at the edge of the vegetation. From what I’ve been told the Clapper rails are pretty common out there, and can be seen at numerous places along Black Point, but this was my first time seeing them. Another good place to check is around the restrooms.